'The Hideaway' is discreetly nestled off a park hidden behind 7th and Pearl. - living room has a wood burning fireplace and a very nice flat screen tv with cable TV and wifi provided. - full bath and two bedrooms, 1 king and 1 queen. -lots of closet space. This home has all new window covering and provides much privacy as you would like. - in the heart of Boulder 'The Hideaway' is tucked away for a quiet respite. sparkling clean complete with bath soaps, shampoos, personal paper, basic kitchen needs such as salt, pepper, coffee filters and all appliances. Oh and of course fresh flowers and chocolates! We hope to see you soon. Although in very near proximity to coffee shops, restaurants, and bars we discourage the party atmosphere. 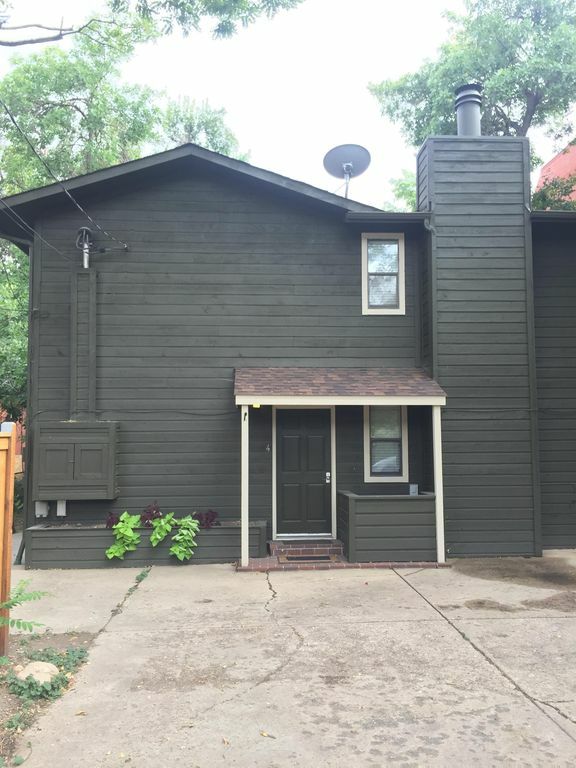 This property is well kept with a service oriented owner catering to the traveler looking for convenience, quiet and the ambiance of downtown Boulder. The good neighbor policy is always welcome. Keywords: At 7th and Pearl this quiet gem is within a few minutes of everything Boulder has to offer. As a business person, and traveler I am happy to help make your holiday comfortable. A Boulder resident since 1979, and home enthusiast I can be accommodating and am versed in hospitality. I will be happy to customize your stay with special arrangements upon request. If you'd like any basic provisions ready upon your arrival just ask............ and it can be arranged. Boulder is an amazing lifestyle. I hope you enjoy it as much as I do. I live in Boulder as my home but feel very comfortable on Holiday here too. You are near hiking trails, coffee shops, bakeries, wine shops, bars and restaurants. the creek path and Boulder creek are 1/2 block away as is the local library. We stayed in this property for 5 weeks during a move to Boulder. First, it covers the basics of what a rental should cover -- it was clean and as advertised. But, it's what was above and beyond by Rusty and his team that impressed me the most. The apartment was outfitted in such a thoughtful way, it was truly beyond my expectation. Everything was thought of, and our needs were aptly met. I was worried that many things we'd need over the course of a 5 week stay wouldn't be there -- but they were. I've stayed in dozens of AirBnB/HomeAways and this was without a doubt the most professionally managed place I've stayed. Other things: the place itself is great. It is nice, updated, and quiet. It is very close to hiking/trails and downtown Boulder. It's also easy to get around to all parts of Boulder... campus, shopping, etc. Really great unit and location. Finally, I just want to say what a great host Rusty was. He took great care of us and I would recommend staying in one of his properties. He will take good care of you too. Overall, can't recommend this place enough. Thanks Rusty! Thank you Sir. I loved having you and your family stay with us. Rusty's house near 6th and Walnut was just close enough to the action to be convenient but far enough off the street to be quiet. We had over 5 weeks here, with company in and out, and found it to be well-maintained, clean, and exactly as described. Rusty was prompt to answer questions and quickly ordered a new lint filter for the dryer when I told him the old one was shredded; it arrived in a few days. He was also quick to offer advice about traffic (should I wait until after rush hour to head south on I-25? yes!) and local real estate. We are not strangers to the area, with relatives in Superior, so we did not need many referrals for food or hiking, but even with (or without) small grandchildren, we enjoyed the Med, the Creek Path, Eben G. Fine Park, Two Spoons (for ice cream) Spruce Confections, Leaf, Chautauqua park and dining hall--and for the 3- and 5-year-old, the wonderful tree stump at the corner of 7th Street and Pearl! I'm so glad you enjoyed your stay here. Thank you for taking time to let others know. The pictures, description, and prior reviews were very accurate. Quiet location, just a block off Pearl and two blocks to the Boulder Creek Path. The location could not have been better. The unit is well equipped and comfortable. We had a terrific stay, Rusty was very accommodating, and would not hesitate to stay here again. Great apartment, great location all good! We have stayed in this apartment twice and hope to have the occasion to stay there again. Love it! We enjoyed our stay for Homecoming and Sorority Mother/Daughter Weekend! The house was clean, neat and a perfect quiet spot for enjoying our family time and visit with our children!! The patio was a nice spot for grilling a family meal and morning coffee! We would stay there again! Thank you! Downtown hideaway was the perfect location for our family ladies weekend to visit my daughter at CU. Walking distance to everything and a short drive to amazing hiking locations. The house is immaculate and had everything we needed for a great stay. Kitchen is well equipped and outdoor seating area was great for a cup of coffee in the morning or wine by the fire pit in the evening. Thanks for a great weekend! Damage Deposit required on all bookings.